In Galatians 1:3, Paul begins his address to the Galatians who have wandered away from the truth by saying, “Grace to you and peace from God our Father and the Lord Jesus Christ.” The emphatic subject is “Grace.” He’s commending God’s grace and Jesus’ grace to his readers who are being beguiled by legalists. They are coming law to them. Imagine them greeting the Galatians from their gospel (which is not a gospel at all). It would say “Law to you.” It argues that God and Jesus send us law to live by through which we can win God’s favor and acceptance. The phrase might be “Law to you, and strife, or stress, or anxiety, from God the Father and Lord Jesus Christ.” Relating to God on the basis of law is a relationship that is totally unsettling, uncertain, and unloving. I’ve known married couples that relate to each other on the basis of law rather than love. It feeds a miserable life. Paul wants to Galatians from the very beginning of his letter to them to consider the difference between what is being offered by the legalists and what he has preached to them about what is being offered from God through Jesus Christ. 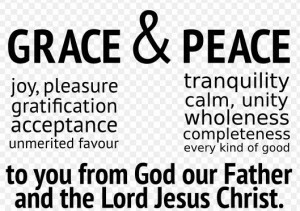 With Grace comes peace from God. Peter begins his second letter with an even stronger greeting regarding grace and peace. It took Peter some time to comprehend the extent of God’s grace with which He would deal with sinners. But once he got it, grace and peace became the central theme of Peter’s life as well. He writes in 2 Peter 1:1-2, “Simon Peter, a bondservant and apostle of Jesus Christ, to those who have obtained like precious faith with us by the righteousness of our God and Savior Jesus Christ: Grace and peace be multiplied to you in the knowledge of God and of Jesus our Lord.” His opening greeting acknowledges that our righteousness is that of “our God and of Jesus our Lord.” It’s not a righteousness earned through obedience to a law. People don’t need law. People need God’s grace and peace. Most people are well aware of their failures and shortcomings, even if they are unwilling to admit it. They know they have a need for help. I’ve heard people say they don’t want grace they want justice. If God gave us justice, as we deserve, we would need “to go shopping for a flame retardant suit.” What we want and need from God is grace and mercy. God extends his gracious hand to the whole world from the cross of Calvary. God is so rich in mercy that he saves us by His grace. God loves everyone. He extends a gracious, merciful hand to everyone. He wants none to perish or none to be fearful of perishing. 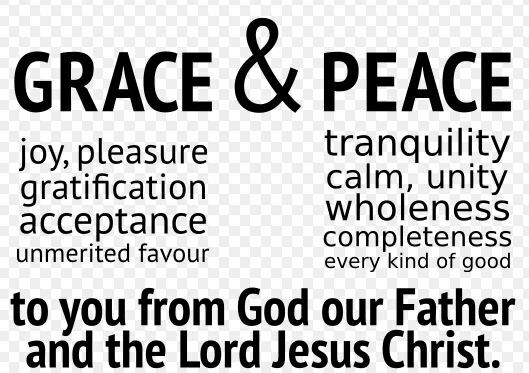 Through Christ Jesus we find God’s grace and it gives us peace with God. Law brings stress and anxiety. Grace brings eternal life, an abundant life.